Create a catalog that your readers can’t put down. We create clean and smart graphics, combine them with sparkling images, and arrive at catalog pages that involve your audience. The recipients of catalogs we design open them and say "Wow, that’s nice." Thanks to our quality design, your customers will spend more time looking at your catalog pages, and more money on your product offerings. Well-organized catalog and newsletter design makes a difference. Our organizational and layout skills provide easy-to-read arrangements for your product images and data. Even complex information can be presented in a way that increases comprehension – leading to greater interest and sales. A summer festival – with dance, music, craft and folklore – celebrates and preserves Appalachian heritage and traditions. A nationally and internationally known center for traditional folk life and folk arts, the Augusta Heritage Center runs a 5-week educational program. The catalog describes classes in everything folksy from Cajun and Creole to Bluegrass and Irish. Students can learn fiddle playing, flatfoot dancing, instrument repair, blacksmithing, songwriting and over 100 more related subjects. The newsletter of Animal Friends, Pittsburgh’s premier animal shelter. Create excitement with your audience by delivering them your colorful, fun and informative newsletter. Petsburgh Press is packed with warm stories about our four-legged friends. The newsletter is printed on low-cost newsprint for efficiency. A very unique holiday catalog asks "Want to give a Cow?" Prospective donors can also buy a flock of chicks, seeds of growth, outdoor plumbing and so many more unusual gifts to help poverty-stricken residents of the world. 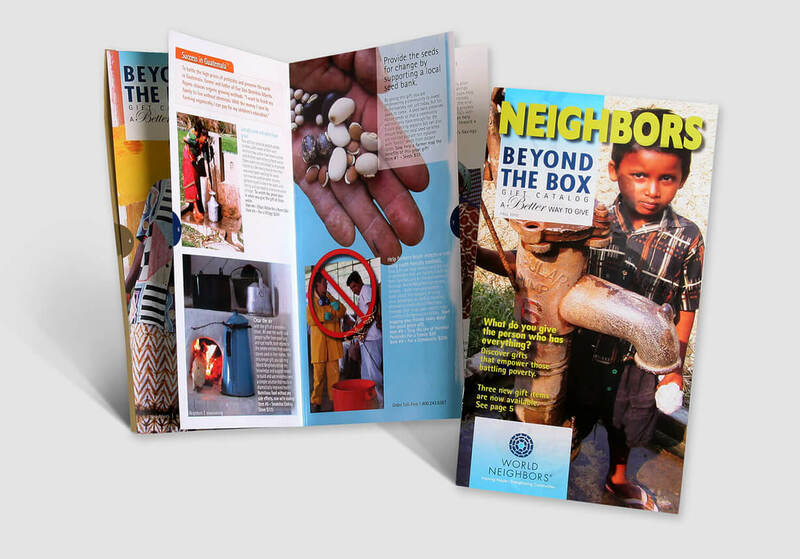 The catalog is mailed to donors and prospective donors of World Neighbors, headquartered in Oklahoma City, OK.
Medical products for infants and premature babies are featured in this catalog. In this case, the company who hired us had a strong brand in place. We gladly followed their design standards to create a catalog that fit in their guidelines and had it’s own flavor. Magazine design is just plain fun. When you engage us to develop the look of your publication, we develop several 2-page layouts to show possible design solutions. We include special icons and div headers, stylized graphs and charts, typography selections and color palettes. Pick and choose, mix and match – we’ll work with your personal taste to arrive at a design style that suits your audience.